Writing a profile for a dating site takes a gymnastic ability with words and the truth. You have to sound clever (but not trying too hard), fun (but not shallow), deep (but not too deep), and like you smell good. You lie about not having any baggage and being open to love but not too desperate. I skip profiles of men that are looking for someone “sweet” or who care too much about what kind of shoes I wear. I don’t like to buy clothes from a catalog. Being the item on the page is even more uncomfortable. I tell myself that there is nothing wrong with “shopping for love.” Lot’s of people have found mates online. It’s really about creating the opportunity to meet someone. But it’s hard to get past the blatant assessment. Where’s the subtlety? The shared glance. Laughing at the same thing that no one else notices. The spark of surprise at instant connection. I’ve been in love three times. Two of those times I fell for someone who was “not recommended.” Wrong age, wrong faith, too much baggage. And the one who checked all the right boxes ended up being totally wrong. Each time love took me by surprise, sneaking up next to me and not looking me in the eyes. It didn’t want to spook me. Online dating is taking love by the shoulders, looking it square in the eyes, and saying firmly, “I want you.” It would be easier to jump out of an airplane. This is Fantastic, Melissa. So real and so true. 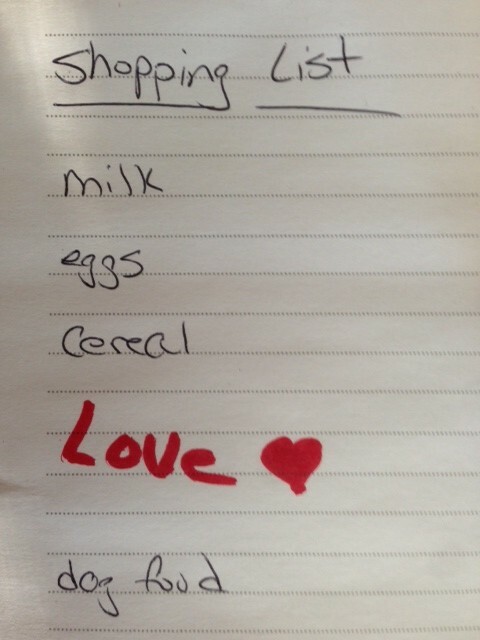 I also love the photo of the shopping list. So creative! Thanks, Teri. Glad that even someone among the “happily marrieds” can relate. You are SUCH a talented writer. Yep, another winner. I laughed out loud at more than one point. Especially the ending! You’re a gift….and you have many. And some day, the love of your life is gonna come your way. So glad you laughed! And from your keyboard to God’s ears. “You have to sound… like you smell good” made me laugh out loud. The other items in the list made perfect sense and served as misdirection for the “punchline” which came out of the blue, but also made sense in its own way. That’s something that Dave Barry used to do to great effect. I like your sense of rhythm; that combined with the length of the blog entries themselves make everything easy to read, but I still feel like I’m getting something out of it. I don’t follow many blogs, but I’ve read all of yours. Thanks, Bob. Glad you like (and that it made you laugh). Thanks for reading. So happy to have some time and to start by catching up on your blog. I love this post! I love love love not only what you say but how you say it. “Writing a profile for a dating site takes a gymnastic ability for words and the truth.” It’s a pleasure to read your writing, so many “aha” moments that resonate with me. Thank you for writing this blog!